For myself, Blyton opened up my young impressionable mind to different worlds, worlds that were magical and also culturally different. For instance, boarding schools are not common options in Singapore because for a tiny island like ours, my elementary school was only a 15-minute walk away from home. Yet through the Malory Towers series, I knew more about how other children lived in other parts of the world. As compared to watching cartoon, her stories left children much room for imagination and creative thinking. I conjured images about how Moon-face and Saucepan Man from the Faraway Tree series might look like and what color would an elf’s clothes be. In my mind, elves were never as raggedy as Dobby in Harry Potter or as suave as Legolas in Lord of The Rings. Rather, they were diminutive in stature, slender with sharp ears and friendly almond eyes wearing green clothes. After more than a decade of outgrowing Blyton’s books, I am truly and deeply impressed that she was able to articulate thoughts suitable for a child. Being a writer or author, it is imperative to write in a way clearly understood by the readers. As such, children authors need to simplify their thoughts and articulate using vocabulary and grammar appropriate for different age groups. As an adult, one could imagine the difficulties to be a children’s author, much less a successful and timeless one for requires us to stop thinking like a grownup and adopt the children’s psyche. As a side note, prior to working on this blog post, I used to assume that Blyton was a white British male and was pleasantly surprised find out she was a white, British mother of two daughters who lived from 1897 to 1968. Although her stories were penned more than 50 years ago, they remain entertaining even for today’s children, making her an evergreen author. Did you read Enid Blyton’s books when you were young? Share some of your experiences here with us! Up coming next in the line of childhood authors who would be featured here would be the creator of the chocolate guru Willy Wonka. Stay tuned! I have not read any of her books. Maybe I should check some out? I’m so happy to see a post on Enid Blyton. Enid Blyton books had been a staple in my childhood together with Hardy Boys and abridged versions of Charles Dickens novels. The first book I remember reading is a cute little book by Blyton called ‘Smelly Little Dog’.It’s one of the few hardcover books that I own,hardcovers are so costly. Then there are the Adventure series,the Secret series,the Secret Seven series,the Famous Five,the Five Find-outers,Mallory Towers, St.Claire as well as some standalones the names of which I don’t recollect now. Did you ever watch the old Famous Five TV series?They are so much fun to watch. The best thing about Enid Blyton books is the food. Her characters eat a lot of yummy stuff and always had my mouth watering and stomach growling while I read.Hard boiled eggs,tomato sandwiches,creamy milk and potted meat never sounded more appealing,especially to a child who hated boiled eggs,milk and tomatoes.I read somewhere later that she used to deliberately include food in her books inorder to compensate for the shortage of good food in England during war times. 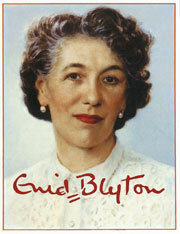 Enid Blyton would be at the top of my childhood list of favourite authors. I loved Famous Five best. I have fond memories of my Year 4 teacher reading our class a chapter of the Faraway Tree books every Wednesday afternoon – such a magical story and what an incredible mind. Disconcertingly, I’ve read that Enid herself was a very difficult woman on an interpersonal level and that she was estranged from her children…maybe she put all of her warmth into her books. It’s so nice to see others who loved these books. I grew up in America and a sweet British woman loaned me her Enid Blyton books…on one condition – that I return them. They were her daughters who was no longer alive. I read and reread the St, Clair and Mallory Towers series, but my favorite was The Treasure Hunters. I did eventually give them back and for years I’ve been trying to find them. I was shocked last year to see some of them available for the Amazon Kindle. I had to, and did purchase what I could find. Thank you for the nostalgia and kinship. oh wow! your post really summed up my feelings for Enid Blyton books. I loved the magic faraway tree books, Mallory towers, st. claire, Mr. Galliano’s circus. Truth is : there isn’t a Blyton book that i didn’t like. There was one story about a black doll that was quite off but the rest was just great. And you not knowing that she was a woman made me chuckle. Crumbs, I must’ve spent an awful lot of time reading Enid Blyton. Never realised it. But then, I did read tons of other stuff, as well. Delightful post – for which I thank you from the heart. Here I finally find someone who shares my love for Enid Blyton’s novels!! I grew up reading them and can still read them at any time!! I took time out to write up about one of her books as well!! And yes.. noone can forget the other authors and books!! Reblogged this on wilko132013's Blog. I grew up in England from age 1-23 years and read so many Enid Blyton books growing up too (oh, and let’s not forget Noddy and Rupert The Bear, and who was the other bear- Barnaby? I’m so pleased that we Enid Blytoners do exist in the world. I grew up on “The Far Away Tree” too and Enid Blyton’s other tales. I even dreamt of travelling on the wishing chair! I wonder if collectors’ editions are available because they would make a permanent mark on my kindle too. I have to confess I didn’t have any of the “Famous Five” though because my Mum never bought them for me. However, my best friend had a collection and I was able to read some of her books, though I can’t remember the stories. Did you ever read the tale of the rude little girl “Mind Your Ps and Qs”? And how she got a “p” or a “q” stuck onto her clothes everytime she didn’t mind her manners? I can tell you that’s how I learnt my ps and qs and that’s how I taught my son his manners too. Ha! Great blog and like the reviews. Thanks for sharing your Enid Blyton reading experiences. It’s just great to know about which books and how others relate to the widely popular author that might be different from mine! Nonetheless, I’ve never read “Mind Your Ps and Qs,” which is a pity. Yet it sure is heartening to hear that you’re also reading Blyton’s books to your son. Hope to see you dropping by the blog more often! Thank you so much for sharing your own memories and experiences about Enid Blyton! It’s really interesting to read and share ideas with like-minded people about common topics. It was certainly great fun for myself to do my little research online about Enid Blyton whilst taking a walk down memory lane to recall my childhood memories which would have otherwise have faded with time. I would have loved to visit Dorset or some of the places that inspired Enid Blyton, so you are so lucky to be living in the midst of all that. If you do have the chance to visit some of these spots, do take some shots of it. I would be interested to know how they look! What an excellent article on memories of growing up with Enid Blyton books, and even though I grew up in England in the 1950’s and 1960’s they still meant everything to me. In my younger years I really enjoyed my Noddy books, and did you ever have any Rupert The Bear stories (although not by Enid Blyton)? Later The Famous Five took me on the most amazing adventures, as did The Adventure series, in particular The Island Of Adventure and The River Of Adventure. 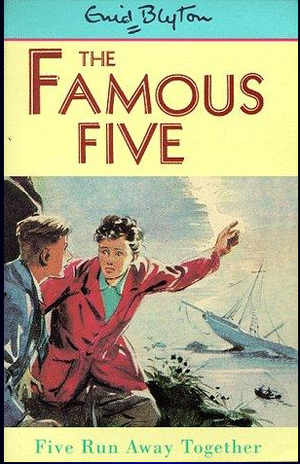 I led a fairly ordinary childhood, rarely travelled anywhere or did anything exciting, except through reading Enid’s books, and I longed to have adventures like The Famous Five. It was only about 5 years ago that I found out that Enid spent a lot of time in the area where I grew up, in Dorset in England, and that some of her stories were inspired by places that I also loved to visit, like Corfe Castle (Kirrin Castle). I wrote a page about Enid, her life and books, which I hope you enjoy. I will be updating this later today and adding a link back to this article. It’s good to hear about others who have fond memories of her books. heyhey i enjoyed reading the Noddy series. i’m looking forward to your next post! it brings back lots of memories! Ah, this is one Noddy fan I see. I must admit I wasn’t too big on the Noddy series. In any case, I can’t wait to write my next author too! Thanks for sharing ur childhood fav books and authors. Reminded me of the ‘good old days’ when I had the time to read. Agree with you that though Enid Blyton’s books may be filled with fantasies, they have lessons and themes which a child can learn from. Looking forward to u sharing more about ur fav childhood authors and books. I’m certainly glad that this post brought back your childhood memories about Enid Blyton and it has certainly been fun for me to write it too, indulging in reminiscing about the past and to rediscover new facts (such as Blyton is a lady not a gentleman) about things I took for granted! Icic. So are you enjoying ur work as a journalist? Btw, r u back in S’pre or still in HK? I’m glad that you’re back in school because it certainly does feel amazing to be on the other side of the classroom, to observe, hear and learn about what others are saying. I think for me, that’s an important way to generate ideas about what to write. Moreover, I also find it critical to formulate your own stance and opinions about that issue, making that article/essay uniquely yours.